Well, you’ve done it, more quickly than we would ever have thought possible. We have now reached a critical point – 60 million classifications means an incredibly robust, well-defined and scientifically valid catalogue of Sloan Digital Sky Survey galaxies. Congratulations to those who won prizes, and thanks to everyone who took part. So what happens now? The site is still here, as you can see, and every classification you make will still improve our results, and will be saved in our database. To encourage you to keep clicking, we’re still giving away individual prizes to one person at random for each collection of 250,000 classifications. To take part, all you have to do is what you do best – classify galaxies – and it will help if you make sure your Zooniverse email address is up to date so we can contact you if you’re a winner. 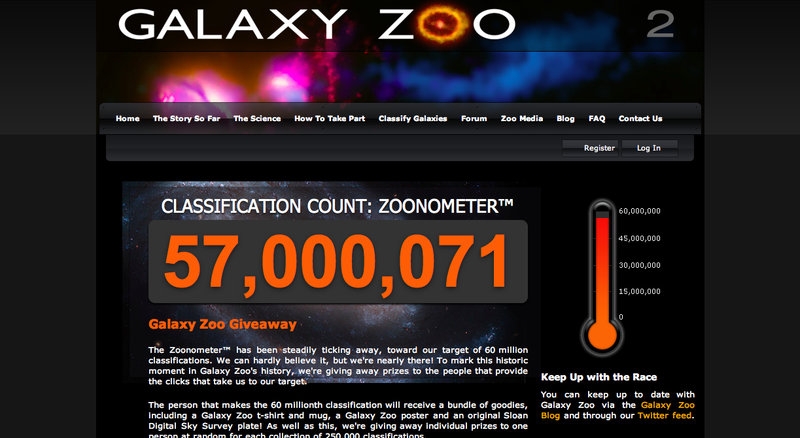 Yesterday, Galaxy Zoo launched a fun little competition to mark the approach of our 60,000,000th classification. This is the point at which we can create an amazing and powerful database from the Galaxy Zoo 2 data. Galaxy Zoo’s ticking clock of classifications, The Zoonometer™, has been steadily ticking away, toward our target of 60 million classifications for a long time. We can hardly believe it, but we’re nearly there! 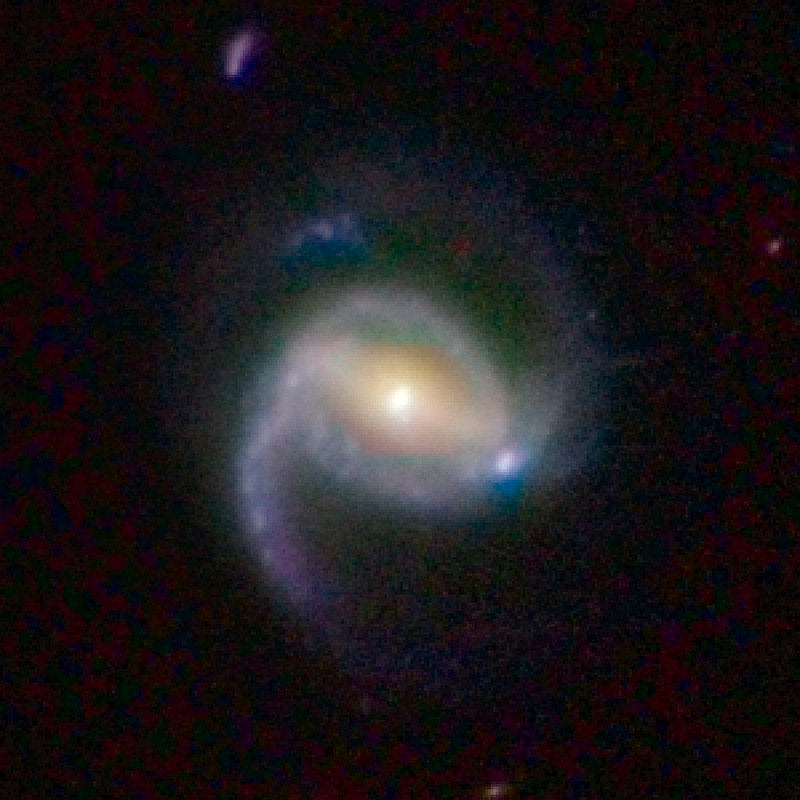 To mark this historic moment in Galaxy Zoo’s history, we’re giving away prizes to the people that provide the clicks that take us to our target. The person that makes the 60 millionth classification will receive a bundle of goodies, including a Galaxy Zoo t-shirt and mug, a Galaxy Zoo poster and an original Sloan Digital Sky Survey plate! As well as this, we’re giving away individual prizes to one person at random for each collection of 250,000 classifications. The prizes kicked off with the 57,000,000th classification, which was achieved last night at about 2100 UT (see extremely geeky screenshot). One of the 250,000 classifications that led us to the 57,000,000 mark will now be selected at random to win a Galaxy Zoo mousepad. We will also be picking a winner from the 57,000,000 – 57,250,000 range as well. The winners will be posted on the Zoonometer™ page. We are appaoraching 57,500,000 as I type this. If you want to take part, all you have to do is what you do best: classify galaxies! It will also help if you make sure you’re Zooniverse email address is up to date so we can contact you if you’re a winner. With 60,000,000 classifications in the database, the Galaxy Zoo 2 project will have reached a critical point. 60 million classifications represents our minimum, ideal database. With that many classifications you, the participants, will have collectively classified every galaxy enough times to create an incredibly robust, well-defined and scientifically valid catalogue of Sloan galaxies. Beyond the 60 million classifications, every additional click still goes into the database – it just means that our minimum science goal is achieved. What is an SDSS Plate? The person who classifies the 60 millionth galaxy will win an original Sloan Digital Sky Survey plate. These plates are quite large and make amazing memorabilia, since they were actually used to observe galaxies by the SDSS. We are lucky enough to have one of these plates at Zooniverse HQ, to give away. 640 holes have been drilled into the plate, with each hole corresponding to the position of a selected galaxy, quasar or star in the sky. During observations, scientists plug the holes with optical fibre cables. The fibres simultaneously capture light from the 640 objects and record the results in CCDs. The plates are interchangeable with the CCD camera at the focal plane of the telescope. You can read more about how the SDSS performed observations on their own webpages.